If the Perfect Pushup Elite is out of stock or unavailable, the Power Press Push Up is our runner-up. Also, check out the Review of our Budget Pick Here. The Perfect Pushup Elite by Perfect Fitness remains a top seller thanks to excellent design and the ability to deliver on workout expectations. The end result was a top seller that has moved thousands of units. The simple design works and does hit all the necessary muscles for improvements in the upper body. The product dimensions on this two-piece device reveal good things can come in smaller packaged. The size is 12 x 12 x 12 inches and the weight is only about 1 lb. Within the construct of the Pushup Elite is a uniquely crafted solid steel ball bearing system. This system contributes to easy and smooth rotation which, in turn, makes for better workout sessions. The handles on the bars are wider than what most would expect in these types of devices. That is a good thing since the wider bars do end up distributing the body’s weight much more evenly. The even distribution of weight makes for an easier workout and helps put weight stress in the areas needed to stimulate the muscles. The Perfect Pushup Elite is capable of handling a maximum weight of 400 lbs. The strong combination of steel and plastic provides the necessary combination of strength and a sleek look. Not too be overlooked is the bottom of the pads. The spiral design might seem odd at first, then the design’s value reveals itself. The spirals help the pads grip the surface of the floor. Less sliding means a better workout. The engineering of the Perfect Pushup Elite intended to bring the largest group of muscles possible into the mix. A better physique is never easy to attain, but the Elite’s ability to make workouts harder does have an impact on muscles. Overall, this is a solid product that stands far above its competitor’s heads. Maximum Fitness Gear developed this particular device. It’s a very good one. What really helps set this particular push up bar apart from others is the accompanying color-coded, bar-insert flat board. When working out, just lock the handles into those sections of the bar that match the muscle groups you want to work on. Newbies to exercises who don’t understand exactly how grip variances work now have a great training device to help them. Not only does this help the upper body, but the entire core of muscles groups is drawn in to a degree. Comfort is a major feature on this workout device. The all-important handles have been cushioned in a non-slip manner. The flat-board is also very study and built with reinforced components. Heavyweights are going to find the added strength and durability of the board to be a major positive. Photos of the Power Press Push Up system might lead you to believe its bulky. Don’t let that worry you. The device disassembled very easily. Storing it when not in use is simple. Reassembling it when the time comes to work out again shouldn’t be much of a hassle. The Perfect Push Up Elite may be number one, but this is a fine second-place finisher. Perfect Fitness created this really simple-in-design Pushup Stands. They do an adequate job at helping enhance push up workout sessions. A full 360 degrees of stability is possible with these stands, and many will be more than happy with this one feature alone. Built with a non-skid platform, these stands won’t go sliding all over the place. The grips are padded, as should be expected. What makes the padded grips special is they help the wrists maintain a neutral position, a nice plus. Consider the Perfect Fitness Pushup Stands to be a decent budget purchase. Produced by JFIT, the Push Up Stand Bar presents a very simple design that may contribute excellent gains during workout sessions. At first glance, this might not look like a solid device. In reality, the chromed steel tube comprising its frame is pretty strong. The sturdiness might not be up to the same levels as other manufacturers, but is still acceptable. The device won’t slip all that easily either thanks to the non-slip end cap on the bottom. As always, the manufacturer put emphasis on comfort. The NBR foam grip is easy to get your hands around and you won’t want to let go due to discomfort. Some assembly is required on this bar, which a few customers might not be thrilled with. Once assembled, those without any reason to take it apart won’t have to deal with disassembly or reassembly issues. The design does make it possible to do a number of different push up variations, which is always a positive for someone hoping to hit a total body workout. The height and width of the bars are a bit more extended than other models on the market. This adds to the potential to perform various exercises. *We Recently Removed 3 of the Push Up Bars from this page as they no longer met the criteria. What is a Push up bar? Push up bars are accessories designed to take the classic bodyweight exercise to the next level. Instead of placing your palms directly on the floor, handles are gripped. The push up bar handles are connected to a buffer than touches the ground. The design of the bars are such that your weight is fully supported while performing the exercises. Push up bars are popular because they enhance the results of the exercise by those who use them consistently. Other ancillary features contribute to the value of these bars. Comfort is one major benefit. The handles on these bars are usually padded with felt or another similar material. Gripping the soft handles becomes a lot more preferable than putting palms directly on a floor. This leads into another benefit. You do not have to get your hands dirty by making direct contact with the floor. Just be sure to clean the handles after each use. As for the actual exercises, push up bars make it easier to achieve full range of motion with the exercise. With the bar, a path is set to allow your chest to get closer to the floor. When just using your hands, you may never hit the full range of motion. As a result, your muscles end up not being stressed in the full and total manner they should be. Push up bars also allow for changing up the angles of the exercises. A standard grip primarily works the chest. A wide grip can hit the outer chest muscles and parts of the front deltoid. Narrow grips work triceps. Inverted grips may stress the forearm muscles. Bars and pads held in separate hands are not the only devices capable of changing up the angles. Single-piece units have been built in such a way that several different handle grips are crafted into the design. As a result, scores of varied angles and exercises may be performed. Not all push up bars are built or designed the same. Different styles of push up bars appeal to different consumers. Some may find one particular push up bar more appropriate for certain exercise sessions than others. Frequently, fitness-oriented persons will purchase more than one type of push up bar. Single-hand padded push up bars are quite common. These are separate accessories not connected to one another sold in pairs. Each are held in a separate hand. Basically, they are designed with a small handle bar is underneath a round pad. These particular bars are easy to use and even easier to store when not being used. 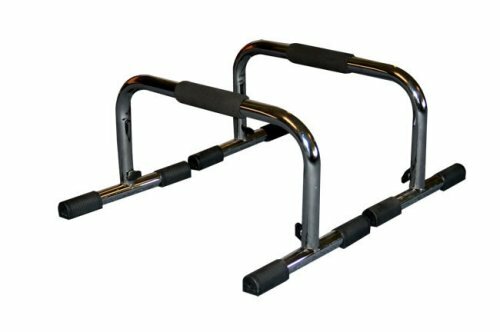 Framed push up bars (sometimes called stand up bars) do not have round pads. Rather, they are made with supporting bars that connect the handles to other bars that act as the base. These framed bars can be designed as one single unit or they could be made to be held separately in each hand. Push up and chin up combination bars are single-frame bars with an attachment intended for connecting the device to a doorframe. Once affixed to the doorframe, you can do chin ups to build muscles push ups to hit the shoulders and upper back more. Safety and durability should be the main factors. A quality push up bar is one built to last. With the proper care, the bar should remain in good condition and support the weight of the person performing the exercises. (Always be sure to double-check the maximum weight capacity on any bar) The bars should also be stable and not be prone to shimmering, shaking, or sliding while performing the exercises. The push up bar should be easy to store and require minimal – if any – assembly. Smaller, single-handed bars may be best for those with limited storage or workout space. Not all framed, single-piece units are unnecessarily bulky so they do remain an option even when space is limited. A Review Guide on the Best Hand Grippers. What do you think is the best push up bar in the market? Leave a comment below to tell us about your new purchase. Also, we’d appreciate if you shared the page. Thanks! 2 What is a Push up bar?